This step-by-step guide explains how to work with your lender to achieve a short sale, so you can avoid foreclosure and get out of an unaffordable mortgage. Simple and straightforward chapters, written in plain English, outline how the foreclosure process works, what a short sale is, and how to determine whether a short sale is the best option for you. All of the implications of a short sale, including how it is easier on your credit rating than having a foreclosure on your record, as well as what it means for your ability to get financing in the future, are explained. 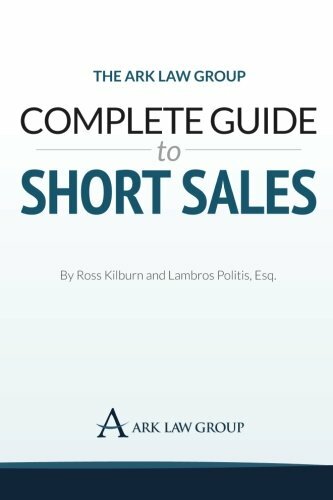 Subsequent chapters outline the short sale process, explaining: – how to prepare a short sale package – what factors make a lender likely to approve a short sale – what to do if there is a second mortgage or other junior liens – who are the parties involved in negotiating a short sale – whether to work with a real estate agent or short sale negotiator – the tax implications of a short sale. The short sale process has changed substantially in the last two to three years, with government guidelines and regulations constantly being updated and amended. “The Ark Law Group: Complete Guide to Short Sales” provides the most current information for 2014, with relevant and up-to-date information including: – the most recent government and in-house lender short sale programs and incentives – the newest developments in wording in short sale approval letters, particular regarding the seller’s obligation to repay any deficiency balance. For many struggling homeowners, a short sale is the fastest and surest way to avoid foreclosure and move ahead to financial freedom. This Complete Guide to Short Sales spells out exactly how to do that. Previous Previous post: Save With A Flat Fee Realtor – With Property Selling And Excessive Commissions! Next Next post: FSBO – Good Idea Or a Bad One?